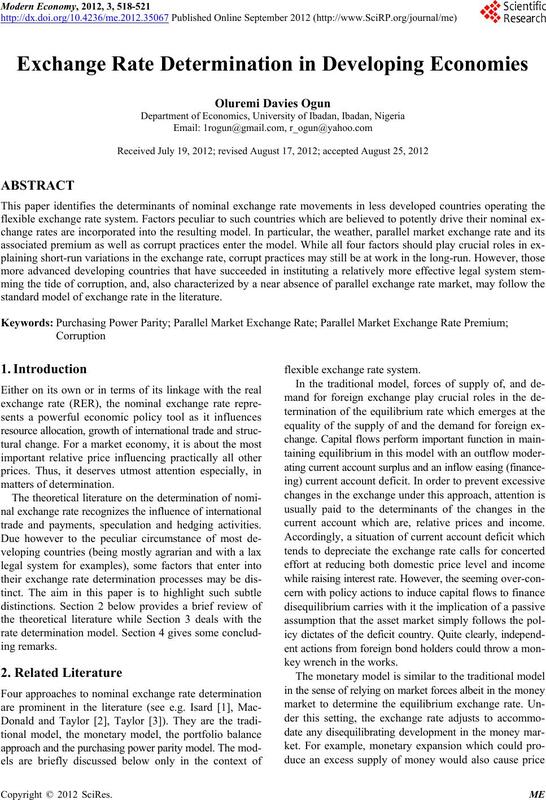 standard model of exchange rate in the literature. trade and payments, speculation and hedging activities. current account which are, relative prices and income. key wrench in the works. source of persistent disequilibrium under the model. effecting the price parity across geographical locations. movements in the explicit rate, the nominal exchange rate. with all partials expected to be positive. market represented by its market capitalization (MK). all other variables’ partials are expected to be positive4. too (see e.g. Dissou and Yakautsava  and Ogun ). economic activities in the typical developing country5. distortions especially, in relative prices, in the economy. premium were also joint beneficiaries6. ossibility of multicollinearity from their joint presence in the equation. arallel market rate over the official rate (see e.g. Dornbusch et al. ). cessities to the importer country) should be considered instead. ket’s) rate but end up selling at the parallel market at that market’s rate. the increase in the patronage of the related markets. tinguishable from the broad play of capital flight. onse to mitigate its macroeconomic effects. onthese additional long-run determinants, see for example, Mishkin . exchange rate dynamics would be explained by this model. a more effective legal system curtailing corrupt practices. introductory section would be more applicable. 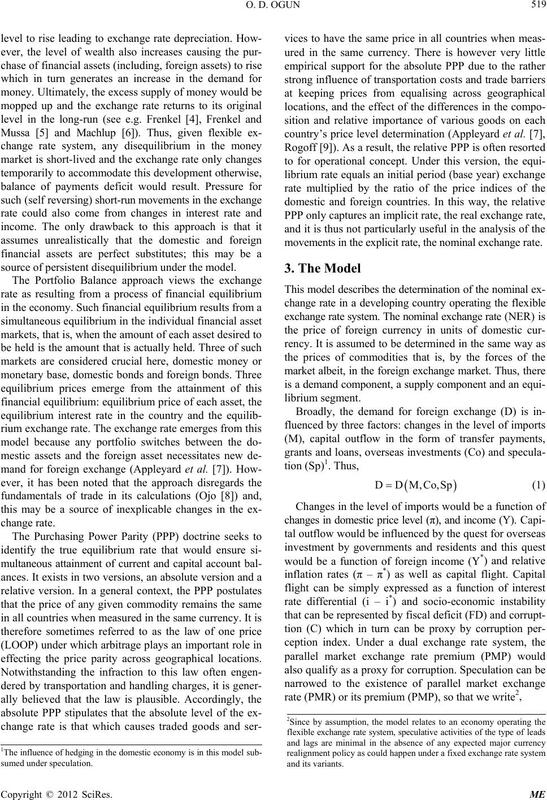 dinavian Journal of Economics, Vol. 78, No. 2, 1976, pp. 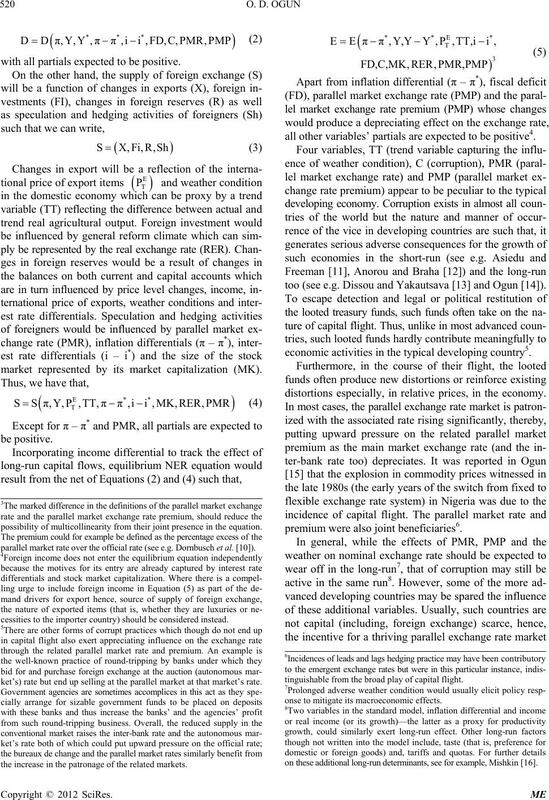 change Rates and the Balance of Payments,” In: R. W.
Economics, Vol. II, 1985, pp. 679-747.
nomica, Vol. 6, No. 24, pp. 375-397.
ment in Nigeria,” Central Bank of Nigeria, Abuja, 2001, p.
nal of Economic Literature, Vol. 34, No. 2, 1996, pp. 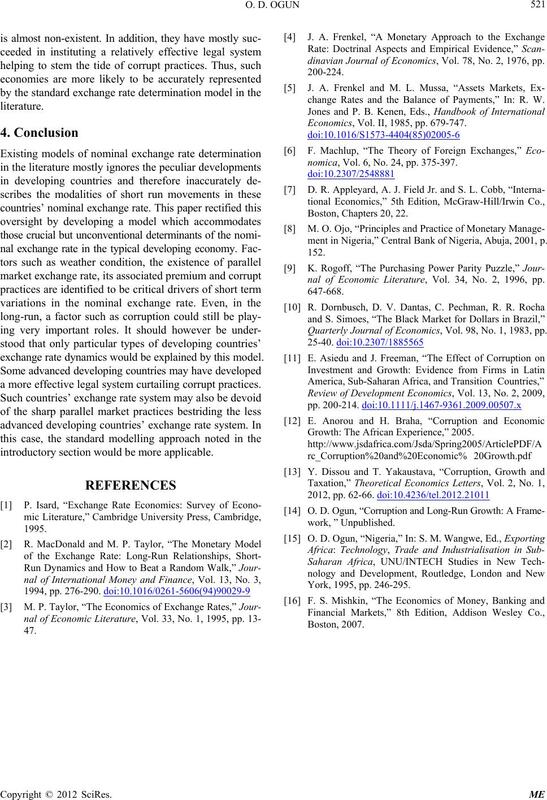 Quarterly Journal of Economics, Vol. 98, No. 1, 1983, pp. Growth: The African Experience,” 2005.